Real Madrid thoroughly dominated the final three quarters to beat visiting Maccabi Electra Tel Aviv 79-53 in the opening game of their best-of-five Turkish Airlines Euroleague playoffs series on Wednesday night at the Community of Madrid Sports Palace in the Spanish capital. 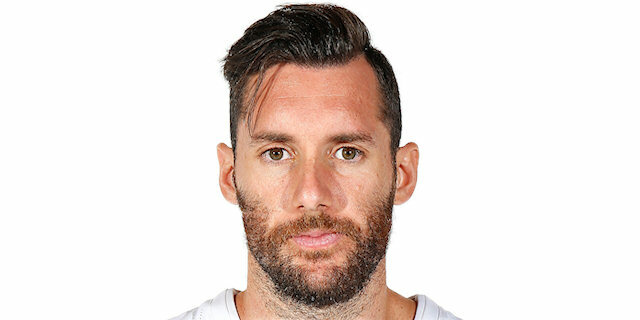 Rudy Fernandez scored 15 points and Sergio Rodriguez tallied 10 points and 10 assists to lead the winners, who also host Game 2 on Friday. Madrid outrebounded Maccabi, 44-28 – including 17 offensive rebounds, made 11 three-pointers at 50% - compared to 4 at 22.2% for the visitors, and its bench outscored Maccabi’s 33-16. Maccabi raced out to a surprising 12-point lead after a Sylven Landesberg tripled early in the second quarter, but it was all Madrid the rest of the way. The hosts finished the half on a 24-1 tear, led 38-27 at halftime and never let up, pushing the lead to 29 in the closing minutes of an impressive win. 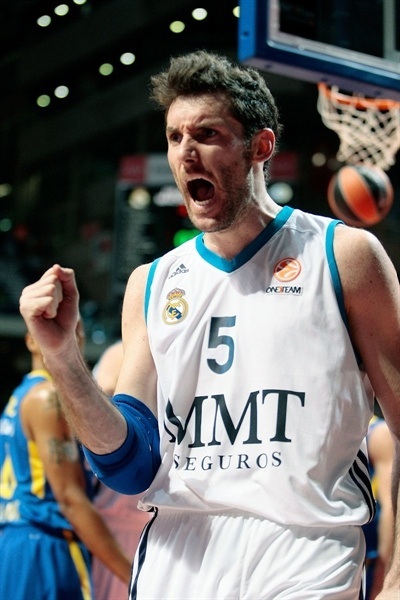 Nikola Mirotic added 14 points for Madrid. Ricky Hickman and Shawn James scored 9 points each for Maccabi, for whom the 53 points scored was the fewest ever in the competition. It was an ideal start for the hosts. 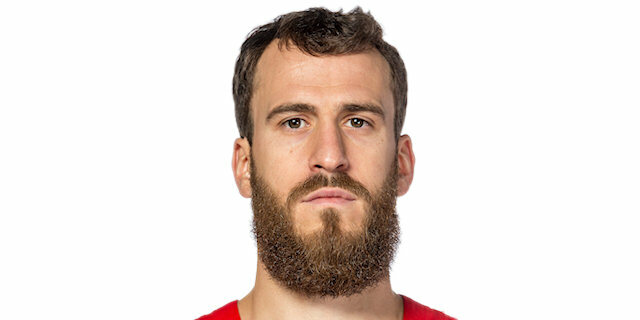 Fernandez stole the opening tip and went uncontested for a dunk, Mirza Begic rose for a block and Sergio Llull drained a triple to make it 5-0. Nik Caner-Medley ignited the visitors with a high-flying rejection. Hickman penetrated for Maccabi’s first points. Yogev Ohayon put Maccabi ahead with free throws and Caner-Medley added a jumper to cap a 0-8 run. Rudy fueled the home side with a three-pointer and then a tough basket-plus-foul to even things at 10-10. 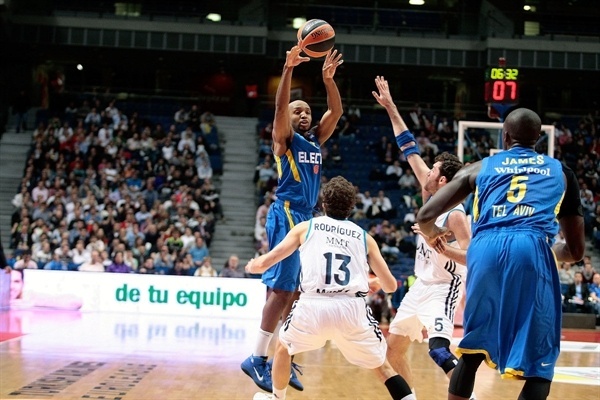 Hickman flashed his speed for a layup before Mirotic scored his first basket for Madrid on the offensive glass. Caner-Medley connected from behind the arc and Devin Smith penetrated for a layup that put Maccabi up 12-17. 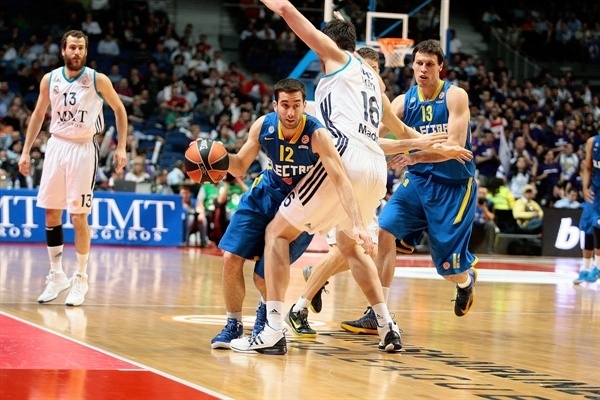 Mirotic scored inside again, but Caner-Medley nailed a second three – this one from a meter behind the arc. Marcus Slaughter, fouled attempting an alley-oop, missed twice from the charity stripe before Hickman’s tripled put the Israeli champs up 14-23 after 10 minutes. 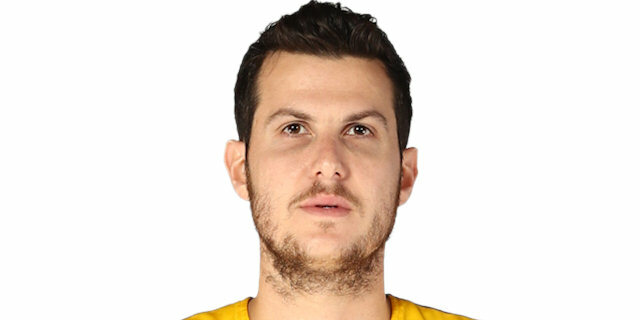 The Maccabi momentum continued as a Landesberg three-pointer made it a 12-point game. 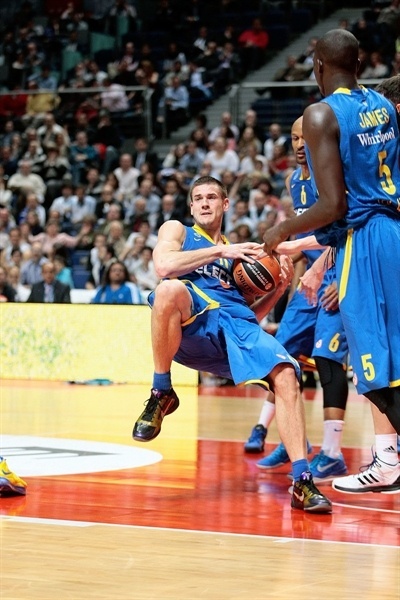 Madrid responded through Felipe Reyes and Slaughter. 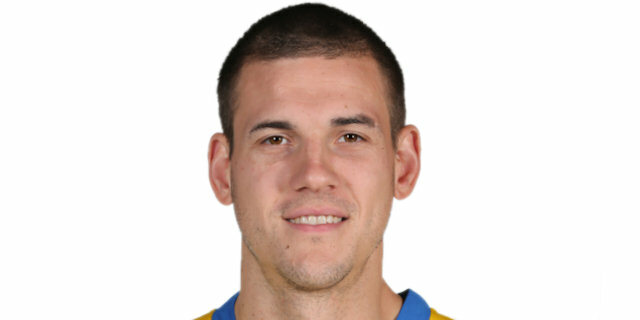 Rudy dunked over Landesberg to put the pressure on Maccabi. Jaycee Carroll banked in a second-chance basket and Reyes sank free throws that resulted from a three-on-one fast break, followed by a Maccabi timeout. Rodriguez pulled up for a three-pointer to cap a 13-0 run that put the hosts back in front, 27-26. 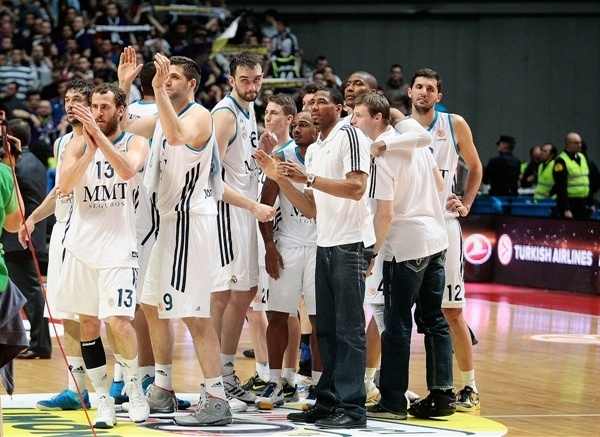 James split free throws to end a six-and-a-half minute scoring drought, but Madrid continued to roll. Carroll’s first triple made it 32-27. Even after Coach David Blatt called a timeout to settle things down, Maccabi lost the ball and Rodriguez buried a three and soon after Carroll made another. Maccabi missed on its final shot and went into the locker room down 38-27 with just 4 points scored in the entire second quarters. Mirotic further extended the Madrid lead with the first basket of the second half before James answered with a dunk for Maccabi’s first basket in more than 10 minutes of game time. A Mirotic triple put the hosts up 14. James and Ohayon narrowed the gap to 10. Smith knocked down a mid-range jumper to make it 43-35. Fernandez trotted through the Maccabi defense for a basket-plus-foul and soon knocked down a three to make it 49-37. Mirotic, shortly after committing an offensive foul, was whistled for a technical and took a set with 4 fouls. Smith split the resulting free throws. 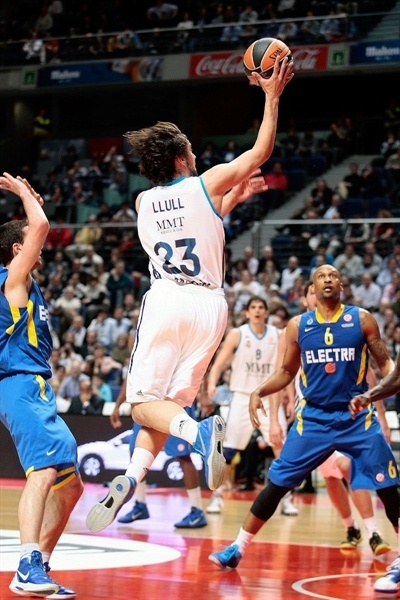 Carlos Suarez and Llull brought the crowd to its feet with triples for Madrid’s biggest lead yet, 55-40. It would peak at 18 after a Suarez free throw. Darko Planinic’s first basket made it 59-43 through three quarters. Begic became the ninth Madrid player to score when he tipped in a Reyes miss. Reyes scored twice and extended the lead to 22. A basket by Landesberg did little to change the momentum. Mirotic reached double figures in points and Llull made it a 25-point game as Rodriguez looked to please the fans with highlight reel plays. 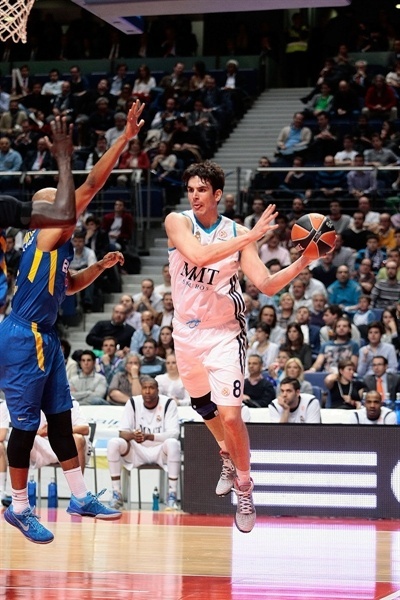 Rafael Hettsheimeir became the 10th Madrid player to score; Rodriguez’s 10th point made it 76-47. Moran Roth got on the scoreboard when he split free throws. A few fast break layups for Maccabi in the closing minutes had nary an impact on the outcome as Madrid marched to an impressive Game 1 victory. "First of all I want to congratulate my team for the victory. It was a good game; we increased our level during the game. Basically, we made a big effort in defense and we were able to recognize the offensive situations. From the middle of the second quarter we dominated the game in the crucial aspects. It is still a long way to play, this is just one game. Thanks to the fans for coming today, we need them on Friday." 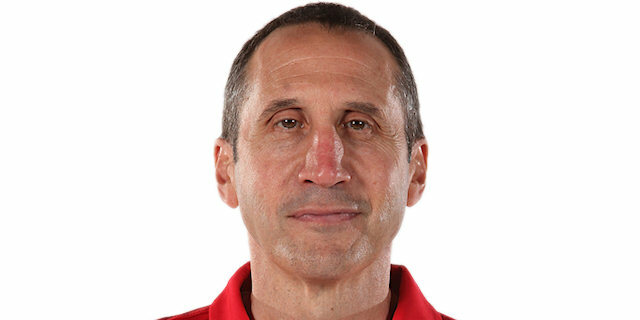 "We came to the bench at the end of the first quarter and we never got back in the game or regained our concentration. We could not develop our normal game and Real took 17 offensive rebounds and made 11 three-pointers. The 79 points they scored is not bad, but if we don’t make baskets, rebound and take care of the ball, it will be hard to win. The things we didn’t do well are very obvious and there are no surprises. Real Madrid did the things they are used to doing and we cannot allow that in a road game. We need to be near perfect to win here and today we were very far from that. " "It was so important for us to win the first game. This is an important step and ii was great to do it this way. The next game on Friday will be a new game for both of us. Maccabi will face the game in a different way, I am sure. The key to this victory was defense. If we can make this kind of defense work, it will be easier going forward. This triumph is a step forward." "We did not score a lot, but the key for winning the game was the hard defense we played and the rebounds. I think this was the most important thing today. It does not matter that we won today by 26 because in 48 hours everything will be different. A new story will start on Friday, but we come with a 1-0 advantage." "They made a run in the second quarter, after a good beginning for us. We made some mistakes in the second quarter. They are a very good team when they can run, they were focused on transitions. We had an opportunity to come back to the game, but they got another run. It is only one game and we will come back here on Friday and keep on fighting. We did not miss our pride, there are a lot of things that we have to fix, but in a couple of days the situation can change. We have to come back here again and try to get the game. It is a long series. We have to check the video, they shoot great from three, we have to solve the problems in rebounds." "The last two years – against Caja Laboral and Panathinaikos – we started badly and today we had a bad game. We didn’t expect this to happen again. We are in a downward momentum and must find the way to recover. I don’t know how to explain it. We need to sit and see what happened, to learn to fix the mistakes we made and there were plenty. We didn’t play well or smart. It was a combination of several things. In the beginning we were aggressive and they lacked confidence, but once they got into the flow of the game, it was hard to stop them. We need to learn to exploit their weaknesses. What happened last season against Panathinaikos does not comfort us today. But we know what is possible because we have experience in these series."